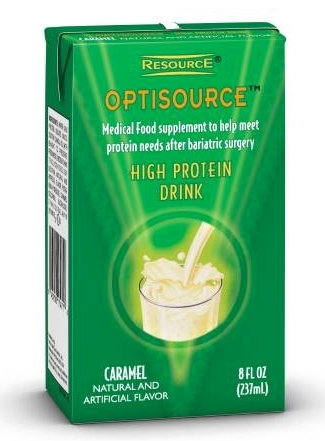 Optisource® High Protein Drink is designed to help individuals after bariatric surgery get adequate protein. Each 8 ounce bricks contains two 4 fluid ounce servings. Each 4 ounce serving provides 12 grams of high-quality protein to help maintain muscle tissue. Optisource® high protein is not intended for usa as a sole source of nutrition, it provides a source of high-quality protein as part of a post-bariatric surgery diet. Available in caramel or strawberry flavor. Appropriate for lactose-inolerance*, gluten-free, low-residue, and kosher. Provides nutritional support for post-bariatric (weight loss) surgery and elevated protein needs.